Its thinnest body and large screen has proved Steve Jobs’ commitment with iPhone family. No doubt, his death was quite a shocking news for the iPhone lovers, but the launch of iPhone 5 (4S) has proved his hard work and determination to make it a valuable hand set. The things Siri can tell and do for you are diverse and will be incredibly helpful in assisting you. This feature is quite different from the rest of the old-fashioned mobile features. Here, you can use your personal commands, rather than relying on third category and low standard commands, which are preset. You just have to say what you want to and it will obey your commands. Here are some good tips for you to use it in a better way. First, you have to hold the “home” button of your iPhone 4S, then press it down and use your voice to speak the words. If you want to have some information about the weather condition in your city, then ask Siri to solve your query. It will bring back positive information about the weather of your city. It’s awesome if you want to go for a ride and don’t know the real weather of the specific area. Mostly, you don’t have enough time to listen to the weather girl in the local TV or radio news bulletin. Like information on climate, you can also ask definitions of different words. It will give you exact information, which you are looking for. For those guys who are into creative writing and they always need new and interesting words, but if they don’t know the meaning, then they can consult Siri. Through this way, they can get the exact word definition from “Wolfram Alpha.” It seems that the days are over when you need to consult online dictionaries for some definitions. Now, it’s time for Siri to do some work for you. If you have good eating habits, but don’t know where to go and where to find a good restaurant, then Siri can bring relevant details based on restaurant ranking. So, you can choose the place which is considered best in town. Sometimes, it becomes a very serious problem when you don’t have any option in your mind and you go to the same old place to entertain your guests. Now, Siri can help you in this regard, as it can provide you with the better options for lunch or dine out. If you are not an early bird and want to wake up early in the morning, then set up alarm clock by just giving command through Siri. You can also command Siri to do stuff like writing text messages and sending e-mails. Now, you don’t have to type something on your own and Siri will do the job for you. You don’t have to touch the screen if you want Siri to do texts for you. The iPhone 4S can follow your commands like a humble assistant with this special feature that will never let you go down. If forget things habitually and leave things in your home or office, then you can set a reminder to pick up certain things like keys, wallet or some gadgets. Siri is powered by the world famous “GPS” technology and it will make noise if you leave certain area. Ultimately, you will pick up your stuff and leave the specific place. It’s a very useful tip for everyone who forgets important things like this. Siri can support languages like English, French and German. Similarly, if you are a very bad pet keeper and always forget feeding your cat or fish in aquarium, then it’s specially designed for you. You will easily overcome your bad habits, as Siri will change it with its regular guidelines. There are hundreds of other reminders, which you can make through commands and Siri will obey them without any objection. Siri is not an app, but a practical magic. It can solve a lot of issues with its state of the art technology and features. It is the essence of iPhone 4S and can be improved further in upcoming additions and models. You just have to stay in touch with Siri and make your life easier. Haven’t you installed Siri on your iPhone yet? Nice Post Really Awesome Job…. Always remember “Content is King” nothing else. not always! you forgot the best of luck and excellent indexing site! Yeah, our main focus should be on Unique Content, there are many factors which affect your site traffic. Rajesh thanks for the review of iPhone 4S, which is indeed an amazing gadget. That is a strange question you asked at the end. Have you installed siri? 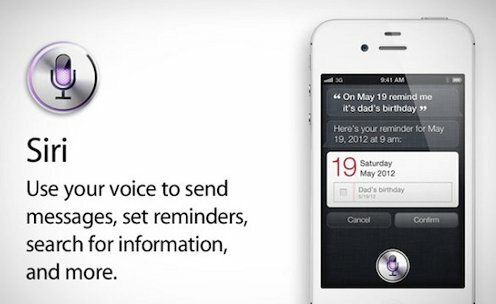 Siri comes only and only for iPhone 4S and you do not have to install it! Rajesh thanks for the review of iPhone 4S, which is indeed an amazing gadget.Thanks for sharing!